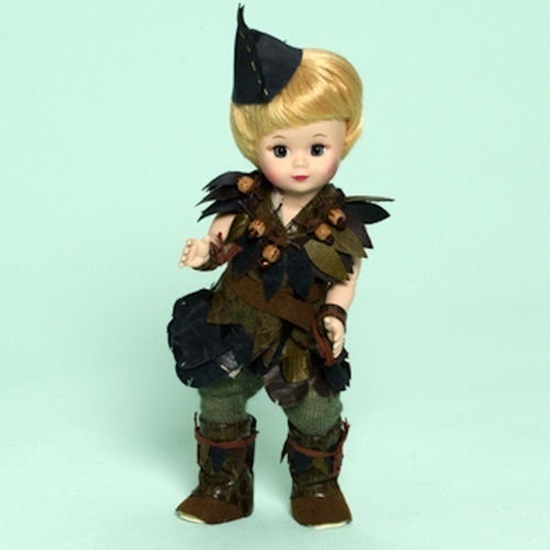 Madame Alexander brings us Cathy Rigby as Peter Pan who is represented in the 2011 collection as an 8-inch bent-knee Wendy with short blonde hair and blue eyes. Peter is dressed in a green and brown textured faux leather tunic that is embellished with cut out leaves and an attached acorn necklace. A brown felt belt, brown soutache tied around the wrists for cuffs and green tights accent this amazing Peter Pan look. Brown and green textured pleather combined with felt and cut out leaves make perfect Peter Pan boots and a cap on the head completes this wonderful Neverland ensemble.